I saw a story on CNBC last week that surely grabbed the attention of marriage and family therapists: 72 percent of bankers say they’ve had at least one extramarital affair. Henry Kissinger said power was the ultimate aphrodisiac. But money must be a very close second, or maybe the two are really one and the same concept. All those federal reserve notes being passed back and forth behind closed doors; the checks with all those zeroes. The deals, the leverage, the groveling for loans or payment extensions. Not that Americans are a particularly chaste lot anyway. The general assumption seems to be that 60 percent of married men and 40 percent of married women have had at least one extramarital affair. Bankers would seem to be a little friskier. The survey of banker bedding habits was done by a website called Here Is The City, a London-based company, and it is unclear whether all of the respondents were from the UK or if it was a more global survey. – Bankers like to keep it in-house. Eighty-seven percent of the affairs were banker-on-banker, involving a colleague from the same bank. – A quarter of male bankers had a fling with their secretary or personal assistant. – A male banker is four times more likely to have an affair than his female counterpart. – About a third of the men said they felt guilty after having an affair. But 71 percent of female bankers felt guilty. That’s the same percentage of men who say an affair is actually healthy for their marriage because it makes them try harder. This isn’t the best way for the banking community to ingratiate itself to an already disdainful public. Most of the outrage among average Americans is focused on Wall Street and the large investment banks, but local bankers probably aren’t winning many humanitarian awards, either. Case in point, the introduction last year of Banker Man, an obese, cigar-chomping predator who roams through city parks trying to eat innocent Americans. It’s true that Americans have a lot of affairs in general but in this respect – and many others that I won’t get into here – they’re hypocrites. In a Gallup Poll asking Americans which issue they find most morally reprehensible, the winner was married men and women having an affair. Only 6 percent think it’s okey-dokey while 92 percent find it repugnant. That beats cloning humans (88 percent); getting an abortion (56 percent) and even polygamy (91 percent). How far we’ve come from the days when Seinfeld’s Kramer was thrown into despair – all because his dream of becoming a banker had been shattered. Somewhere out there now in Rerun Land, he must be counting his lucky stars. “Welcome … to a night of total terror. The Night of the Living Dead. The dead live on living flesh. The dead, whose haunted souls hunt the living. The living, whose bodies are the only food for these ungodly creatures…. But still, the perfect fodder for a Centers for Disease Control public relations campaign. The government wants you to know that there are emergencies that do pop up from time to time, and very often it’s something you don’t expect. Interesting, isn’t it, how every emergency kit should contain duct tape? Parenthetically, completely off topic, I was flying once from Toronto to Orlando and the pilot came on the PA and said that the takeoff was being delayed while the crew made some last minute repairs. And then we saw one of the flight attendants come down the aisle with a large roll of duct tape. 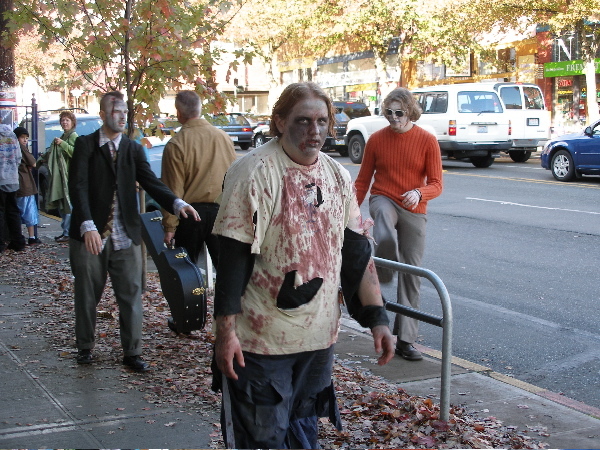 The real question here is not why the CDC is suddenly interested in a zombie attack. Although it does make you wonder if the feds know something we don’t. We survived one apocalyptic prediction this weekend but the Big One is coming up when the Mayan calendar ends on Dec. 21, 2012. So keep those water jugs handy. No, the question is: Why are Americans so intrigued by zombies? The first thought is that it has to be related to universal fear of some unthinking, unfeeling, robot-like enemy, and take your pick. Communists loom large. Or just plain vanilla socialists. The Republicans are worried about the Democrats and the Democrats are worried about the Republicans. It’s a sign of the times. Here’s a website that looked at popular movies and tried to tie them into social problems throughout the 20th century. The editors found that the number of zombie movies soar when upheaval is in the news. Well, there’s a new batch of zombie movies coming out this summer, in fact. But there’s some good news on the apocalypse front. Some statisticians feel that the folks who’ve been reviewing the Mayan calendar situation may have misjudged. The truth is, the date may be off by 50 to 100 years. So thankfully, it may not be our problem. American culture can be puzzling and occasionally preposterous. As one example, I could never really grasp the whole tattoo craze. A trend that began among military men and women worked its way into the poor neighborhoods and prisons and finally right up to the skinny high school kid who’s bagging your low fat frozen yogurt at the local supermarket. College towns are awash in colored ink as the bar crowd empties into the streets after a night of drinking. They weave their way to the local tattoo parlor for a draw-dropping design that will show friends and family back home how unique they really are. I went to see a doctor last week and his assistant, I’m willing to believe he was a nurse, perhaps an RN, was tattooed all up and down his neck. I think he had a nose ring too, but I couldn’t swear to it because my attention was drawn mostly to the tattoos. He may also have been wearing a gray Brooks Brothers suit with a power tie but I wouldn’t be able to tell you for sure. Most of the people at the supermarket where I shop have tattoos of one kind or another, even the middle aged cashiers. 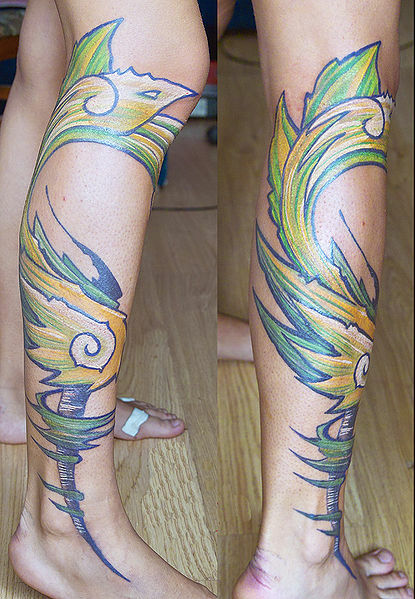 A favorite option is to have a very tasteful and artistic rendering on the ankle or wrist, or sometimes the neck. The women prefer butterflies, the men, knives or flames. But that’s not a hard and fast rule – women sometimes sport the most aggressive designs. I know that the tattoo craze has been a long time a-brewing but I never realized how big an industry it has actually become. It’s so massive that if the government suddenly decided to outlaw tattoos our GDP would probably shrink by 2 percent. It’s become an international phenomenon and its popularity has become one of our few global exports. We can’t make machinery, clothing, home accessories or auto parts, but when it comes to pop culture, the U.S. has cornered the market. Tune into the Travel Channel to see a show about the Saigon River in Vietnam, and you’re likely to find that the owner of the boat leading the tour is wearing a New York Yankees baseball cap. It’s the Americanization of international culture using products and equipment produced in China, Taiwan and Brazil. Tattoos have become popular in every nook and cranny of the world. Tattoo.tv – “Your tattoo social network” – has a list of all of the tattoo conventions worldwide in 2011. I counted 179 conventions in the first six months of the year on the site’s convention page. Many of the gatherings are in the U.S. but others are in such far-flung places as Thailand, Venezuela, South Africa, Costa Rica, Slovakia, Greece and Poland. These tattooed minions share a certain camaraderie. They have created a community that sets them apart from the norm. “I’m a little different and I don’t mind showing it,” they’re saying. “I live a little closer to the edge.” It not only brings them closer to art, it makes them one with art. I’ve never seen a sociological analysis of the tattoo trend, although I bet one exists. In default, I would return to Kurt Vonnegut’s explanation of the Granfalloon in his book, Cat’s Cradle. Vonnegut defined a Granfalloon as “a proud and meaningless association of human beings.” His example is Hoosiers in Indiana, but it could just as well be Gators, Badgers or Wolverines. These associations can actually bring about happiness, Vonnegut argued, and can help people lead contented lives. Nevertheless, they are based on a rather flimsy foundation of fantasy and myth. Here’s another dollop of American culture that’s bound to have at least a few of us folding our arms and saying: Hmmmmm. It’s the concept of parents pushing their children in strollers when it looks like the kid may be old enough to run a fairly competitive 50-yard dash. This is quite common in New York, according to the blogger who follows this stuff. But you also see a lot of it in theme parks among parents who don’t want the hassle of chasing their kids from one ride to another or worse, losing track of them. Is this the latest incarnation of the child “leash” that captured the imagination of parents a generation ago? Maybe, and this illustrates true beauty of American society – always pushing and prodding one another toward the Next Great Idea. The envy of the world. But hey – can any of this stuff be copyrighted? 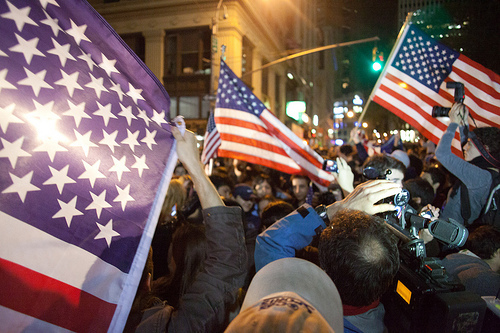 Some people were unsettled by the celebrations that erupted last week over the death of Osama Bin Laden. On the night of the announcement, we saw people marching through the streets waving the flag, or even hanging from trees shouting joyously. In a way, it eerily echoed the sort of revelry that goes on when a sports team wins a world championship. President Obama said during his 60 Minutes interview on Sunday that was careful “not to spike the football” with regard to the Bin Laden killing. But the administration certainly built up the drama leading to the announcement – you have to wonder if what was said at 11 p.m. couldn’t have been said at 4 p.m. The tension was pretty thick and I wondered if the cable news talking heads would be able to fill in much longer as we waited and waited for Obama to step up to the podium. The reaction on the streets was all perfectly healthy and normal, psychologists told the New York Times last week. One thing is clear. Particularly for people in New York, this was as close to a moment of closure as they’ll ever get. It concluded one part of a war on terror that has had a lot of confusing twists and turns. The assumption was that the 9-11 attacks were the work of Bin Laden and Al Qaeda, but only a year later we learned that Public Enemy No. 1 was really Saddam Hussein and his backers in Iraq. Bin Laden, Bush said, had been marginalized. Obviously for most people, Bin Laden remained pretty high on the radar screen. It was certainly no death blow to terrorism, but there’s something to be said for achieving a measure of justice now and then. The question is whether we should try to boil the whole thing down to a few words on a bumper sticker or a banner in the street. I was recently watching one of the rare reality shows that I find interesting, Bizarre Foods with Andrew Zimmern. He was doing an episode on the wackier side of San Francisco cuisine. People who like the show know that if you’re watching Zimmern, you’re probably not going to see a review of the classiest five-star restaurant on Fisherman’s Wharf. One of the segments was about a group of homeless advocates who prepare meals for street people by using foods and ingredients they find in dumpsters. He followed them around during the collection process and learned to his astonishment that they managed to harvest some pretty decent produce and cook a hearty stew out of it. Then he surprised me with a statistic that I found amazing: Americans throw away up to 40 percent of their food. And it’s not always because the stuff is beyond its expiration date, or has otherwise gone bad. “Top experience in my top five – not even a shadow of a doubt, was Margie flinging open that dumpster. I thought maybe we’d find a few throw-away bananas or something, or maybe a bag of garbage from a fast food restaurant we’d have to pick through to get some French fries. My parents (and probably yours) always declared that it was a sin to waste food, and growing up my mother seemed to scrape together meals from whatever was leftover in the fridge. Their mindset came from their parents and grandparents, who went through some lean times and knew what it was like to struggle to feed a family. Somehow that chain of thinking has been broken. Food is not a coveted commodity anymore, even though a trip to the supermarket is getting increasingly expensive. You hear a lot more people talking about how to save gas than how to save on food costs, or cut out waste. Bloom argues, and it makes sense, that Americans buy too much food in order to keep their fridge “stocked.” But in fact, unless you have a large freezer and are extraordinarily adept at packaging and storing meat and other items, you will never consume it all before it goes bad. Part of the reason for this, I’m convinced, is the way a refrigerator is made. If libraries stored books the way families store food, many of them would never be read. For every new item stored, you push a previously stored item one position toward the back. And the back of the refrigerator is merely a waiting area for its final two destinations – the garbage can and the landfill. Someone ought to design a fridge with a series of trays and doors that swing completely out, making all those leftovers visible, crying out to be added to the next ad-hoc lunch or dinner. I mean, if we can put a man on the moon … well, never mind since that’s another mindset of a bygone era. 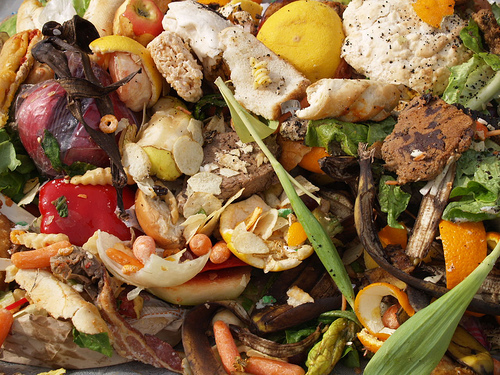 Bloom figures 25 percent of the food we bring home is wasted. Add to that what you leave on your plate in a restaurant, which can be considerable depending on the quality of the meal coming out of the kitchen. Cutting back on waste would pay off in many different ways. 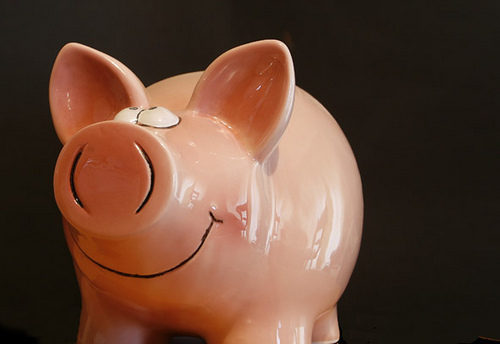 One, you’d save on your home grocery budget. That’s not an insignificant amount. Two, if food conservation were widely promoted, it would reduce prices since commodities do respond to the law of supply and demand. Our parents and grandparents would just say that it’s a shame these kids are going hungry, and we ought not to be wasting food.